Evaluate the person who is having difficulty getting around. If they’re in a wheel chair or their medical condition could lead to further deterioration that might land them in a wheel chair, there are additional considerations. First things first. The mobility challenged person has to be able to get into the bathroom. In many older homes the doors just aren’t wide enough. For wheel chair access doors really should be three feet wide. And to avoid another hurdle, remove the sill. Then, of course, they need to whirl around in the wheel chair to leave the bathroom. A 60-inch diameter of clear space is required to make a full turn. You can cheat a little on this—some of the space can be under the sink where there should be at least 27” to 29” clearance and no obstructions on the sides. Everything the mobility-impaired person needs for their hygiene should be at the tip of their fingers—tissues, towels, soap, shampoo, shaving cream, makeup and more. So place a medicine cabinet at a reachable height. You also might want to swap out knob faucets for some with long levers and lower the light switches. The best way to make sure that everything is at the right height is to check out the bathroom sitting on a chair. You want all the fixtures – the toilet, the bath, the shower to be easy to use. That means replacing a standard toilet with a comfort-height toilet or adding a toilet height extender for easy transfers. 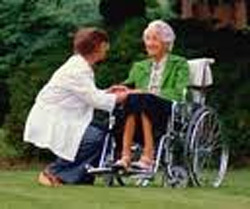 Or, for even bigger boost, you can install a Tush Push Toilet Lift that raises the user up just like a lift chair. You might need a walk-in (or roll in) shower. For someone who can’t stand at all, add a shower bench or chair. Another good addition is a walk-in tub. You can replace the existing bathtub with a walk-in tub or convert it by adding a tub cut and watertight door. Last but not least install grab bars in the shower, by the tub and toilet. Happy remodeling. Bye for now…..George Flowers. Have you had any successes remodeling bathrooms for mobility impaired people? Do you have any questions about how to remodel a bathroom that I didn’t cover in this article?